We are still in a transitional period here in Southern California. Some days are in the 70s, others are in the 90s. Fall has officially been here for several weeks, but it still feels as hot as midsummer. Weather reports say that this weekend, when I go to the Pasadena ArtWalk, it will be in the mid 70s — beautiful — but truly anything can happen and all we can do is make the best of it and be thankful that torrents of wind and rain are unlikely. When I visited Evanston, Illinois this past summer for our daughter’s graduation, the weather was beautiful for our entire visit. But a week later, at an art fair in town, winds tore up the booths and sent some sailing several stories in the air. I felt so badly for the artists at that show. For many exhibitors many months of work were wiped out in an instant. The point is, some things, like weather, for instance, and the actions of others, are out of our control. We can make ourselves miserable trying to anticipate all of the contingencies and prepare for them, or accept that things happen and not try to second guess how we could have made things turn out differently. Of course, this sort of thinking is just folly. Just as there’s no way to predict the vagaries of wind and weather at the micro level, there is no way to predict human behavior at that same micro level. And you can drive yourself to distraction trying to guess what others want. All you can really do is create what YOU want. And to try to do it as best you can. You cannot control outside events, try as you will. But you can learn to adapt to their consequences. nice reminder, karen, thx. i think my biggest struggle is others’ perception that what i’m doing is indulgent, because there’s no regular wage attached. i think it hits from internally, too – among the nagging voices at the back of my head. in my forties, they are slowly quieting, but they’ve been so loud for so long. my dear dh said please hurry the other day when i talked about finishing and selling my ms. nothing quite so hard a shove off a cliff as a gentle concerned voice, eh? It has taken a long time for me to develop acceptance. When it comes to family life, the “domestic” front definitely qualifies as an “external” event. As a mother, there are so many demands placed on you that you really can’t control. You plan a two-hour writing stint? Someone spikes a fever and you end up at the pediatrician’s office instead–or the hot water heater springs a leak–or an older child informs you of a last-minute supplemental soccer practice. Having an infant at home is perhaps the biggest test of one’s ability to “go with the flow.” My current MO is to expect nothing, but be prepared for windfall. You just never know when a two-hour bonus nap will grace a random Tuesday. Today I experienced yet another reminder of how expectations often conflict with reality. On the positive side, Saturday’s Art Walk was very successful. Not only did I sell more paintings than I had conservatively hoped to, but I have a potential commission as well. On the way to the event I reminded myself of the Aurelius quote and was determined to be positive about the event, come what may. Did my positive attitude perhaps affect sales? Who knows? But it didn’t hurt. 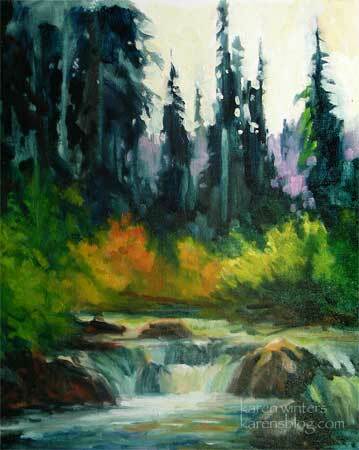 On the negative side, I had planned to get up this morning and finish a plein air painting I worked on yesterday. But brush fires have suddenly popped up in an area where friends and family are living. And although they are not in imminent danger and there is nothing we can do to help, the news and phone calls are enough of a distraction that I may not be able to make progress until tonight. Cathy, there may not be a regular wage attached to your work now, but I’m assuming that you do want to profit from some aspect of your work at some point, so they need to be patient during this time. Regarding those nagging voices – do you find that they have repetitious harangues and almost get into “loops?” If so, I have a good way of dealing with them. Miranda, I hear you. That is why I had to wait until 5 years ago before revisiting my passion for art. Until our son graduated from high school there were always games, activities, projects, and so on, not to mention aging parents. You have to make the most of the mini moments, yes. thanks, karen, i got a good handle on those voices some time ago with meditation and counter thoughts. sometimes they do creep back, but aren’t nearly as viciously in the loop as once they were. a lot is just my own guilt as we live very hand to mouth at the moment. although, i’m sure there are many of us here who would love to see a blog from you on how to cope with the voices! my mil lives with us and is of a very practical mind. she doesn’t generally say ‘get a job’, but she can do more with a look or anti-look than most. lol! conversely, her husband was an artist who put it aside for many years, but who blossomed as an artist in his last 2 years while he battled cancer (time to hold paintbrush rather than a hammer while getting chemo), and in his last months had a huge gallery show. so i think she can see and has respect for the artistic process and what it means for the artist on some level. as long as i keep producing pages and talk about networking for children’s publishers, i think we’re all ok with it, but it can still be a daily struggle. ooo, ooo, who said , “Art is always a risk?” i think it’s an old quote, but was in that little clip miranda posted and restated by the children of one mother who is living by her art.